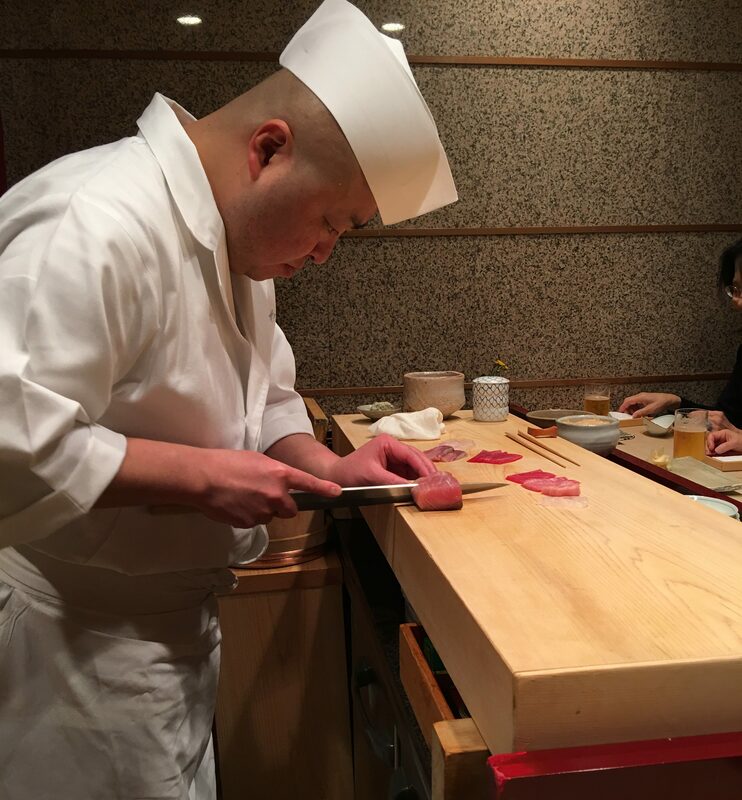 Having had Michelin star sushi the night before, what are the odds that I would have Michelin star sushi again the next day? 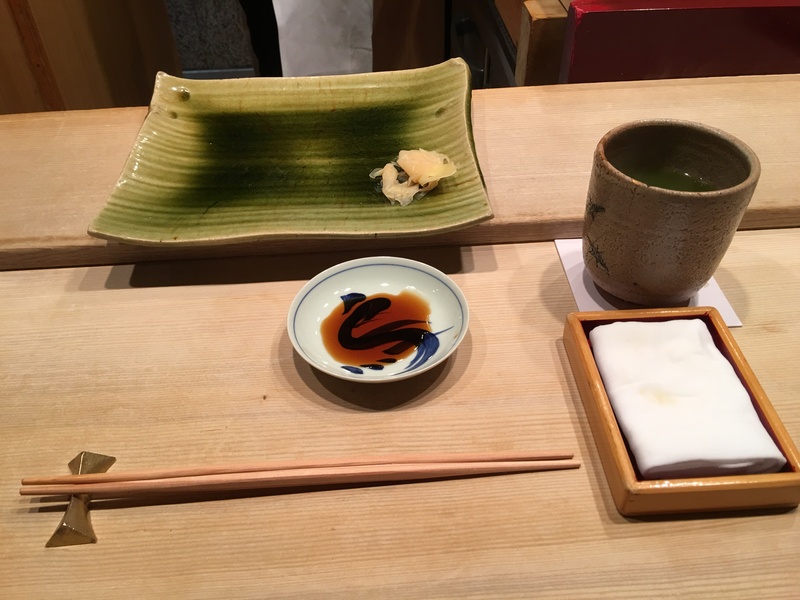 Apparently pretty good, because here I was at 鮨かねさか Sushi Kanesaka for lunch the next day! 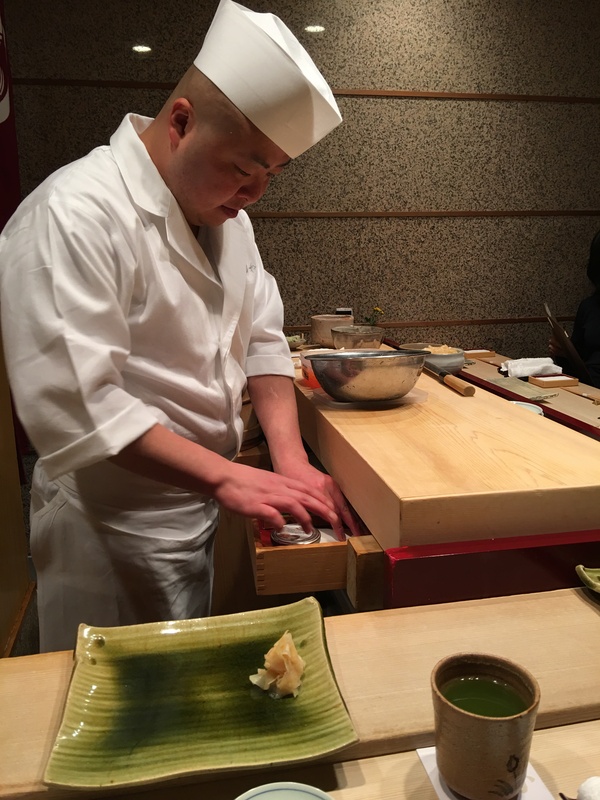 Well known in the sushi world, Kanesaka-san opened an outlet in Singapore, and has a second outlet at the Palace Hotel in Tokyo as well. But here we are at the original. 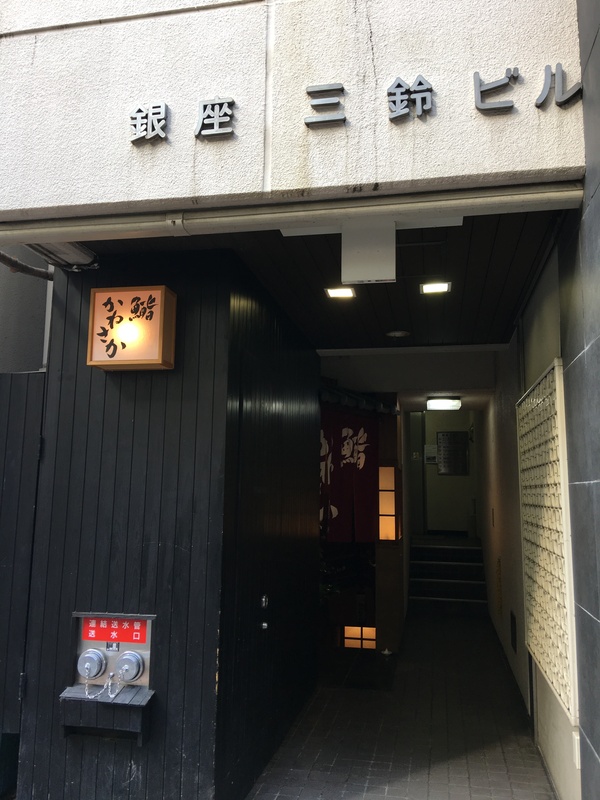 Located 2 streets over from the main Ginza drive, near the Toy Park, Sushi Kanesaka is in the basement. 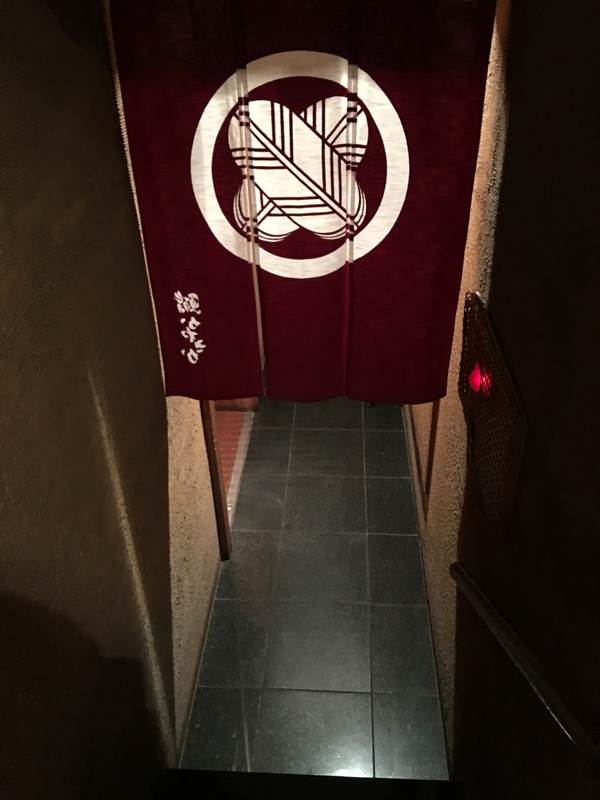 The entrance to the basement. 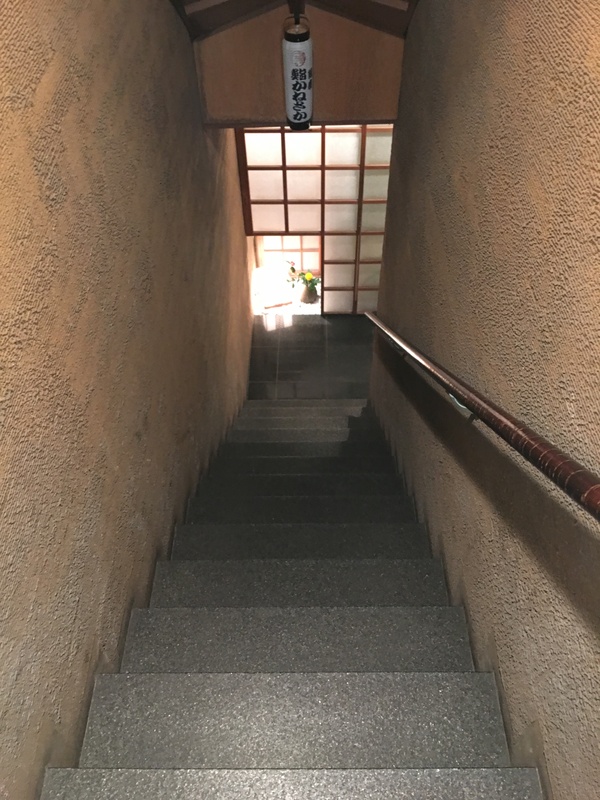 Down the stairs and around the corner. And there we go! We were a little early, as we had an 11:30am lunch reservation. They open at this time, so they ask you to wait upstairs and then they come and get you. Inside, there are two sections, both sides seating 8 people. We sat down and were amongst a set of Japanese housewives, a tourist from Hong Kong and a Japanese tourist. We were attended to by Sanpei-san, the trusty assistant to Kanesaka-san. His english is great and he is so hospitable, the experience was great with him. For lunch we had a choice of 5 selections. 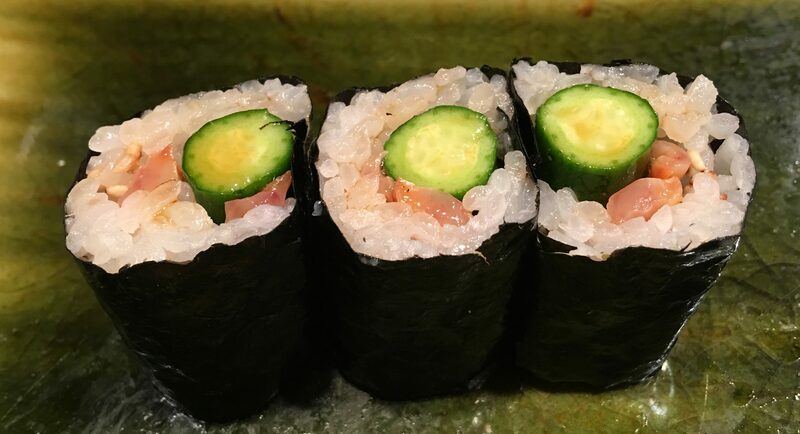 3 of them were just sushi, basically the small, medium and large. 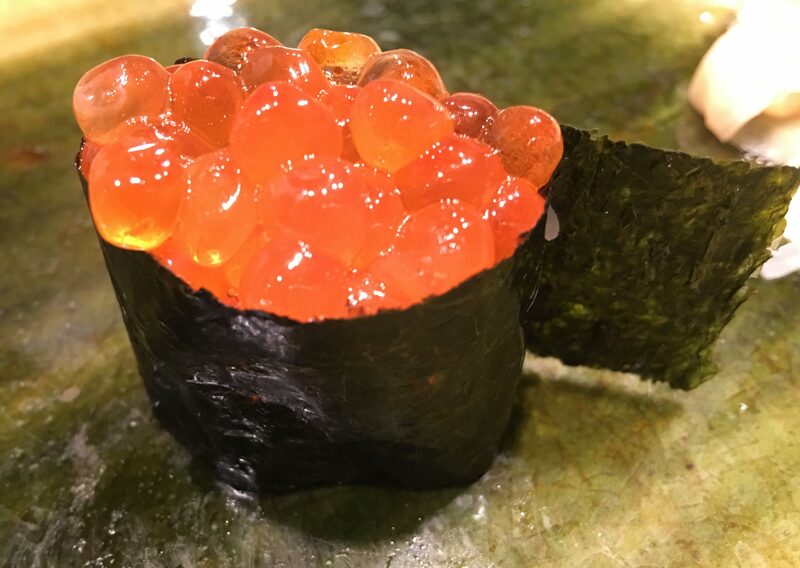 And then there was also an omakase involving some other dishes and sushi. There was also a pricing difference of course. 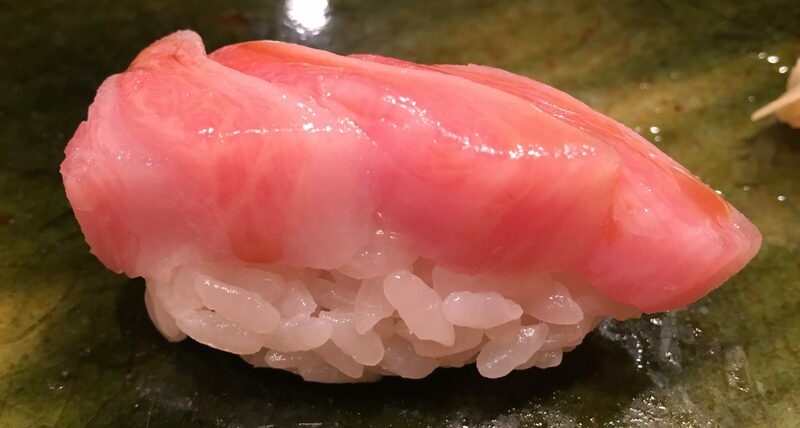 For the sushi, it was 5,000, 10,000 and 15,000 yen. 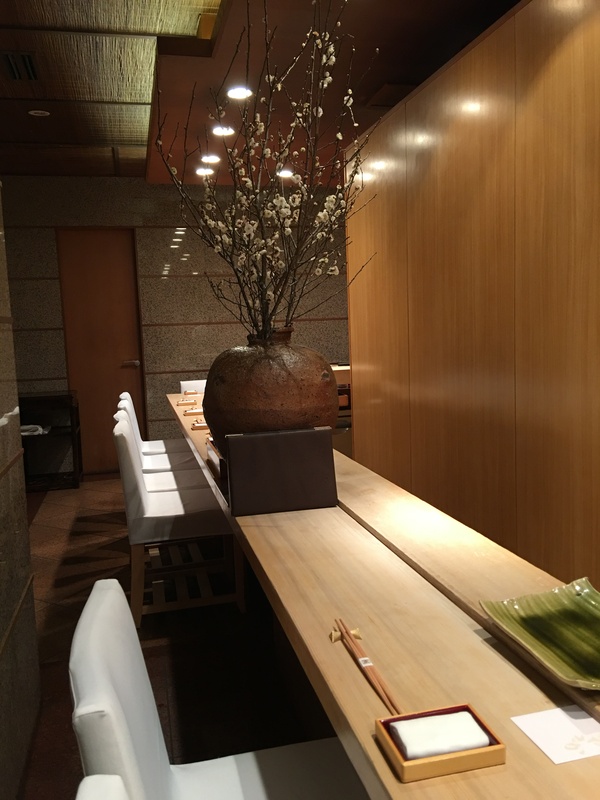 For the courses, 20,000 and 30,000 yen. I went for sushi only. I wasn’t sure if I wanted the dishes and decided to go for the full and large sushi course. Our neighbor, the Japanese tourist, went for the 30,000 yen course. He got the cooked crab piece, the fish sperm, and some other hot dishes and about 7 pieces of sushi. 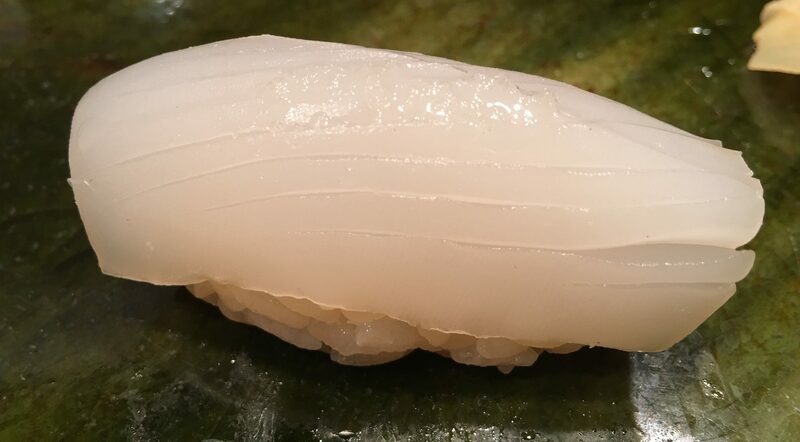 After seeing that, I sort of am glad I went for sushi only. But let’s see how the star was earned here! The setting for the meal. Simple. 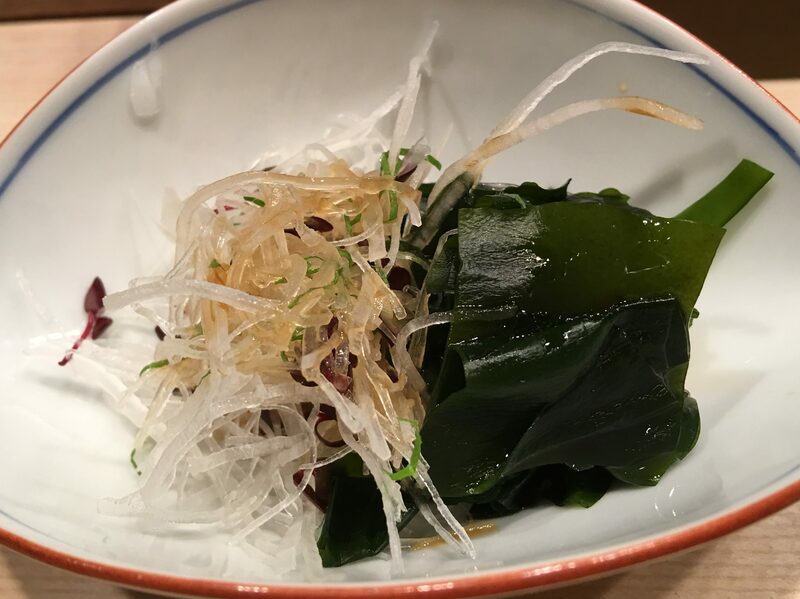 We started with some simple seaweed and veggie. First up was Karei – Flounder. Then some Tai. 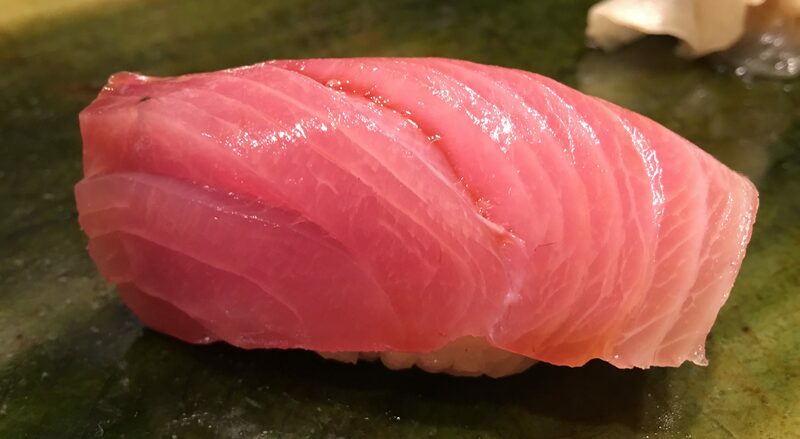 Followed by Buri. Sanpei-san hard at work feeding all of us at once. 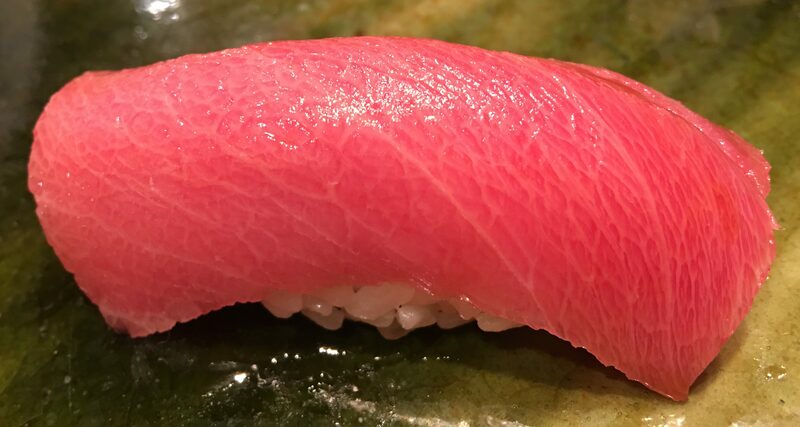 Maguro. 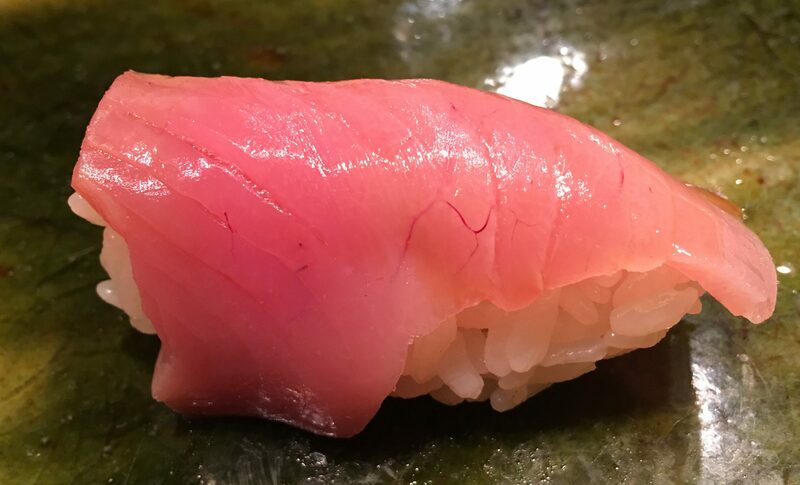 Then onto Chutoro. 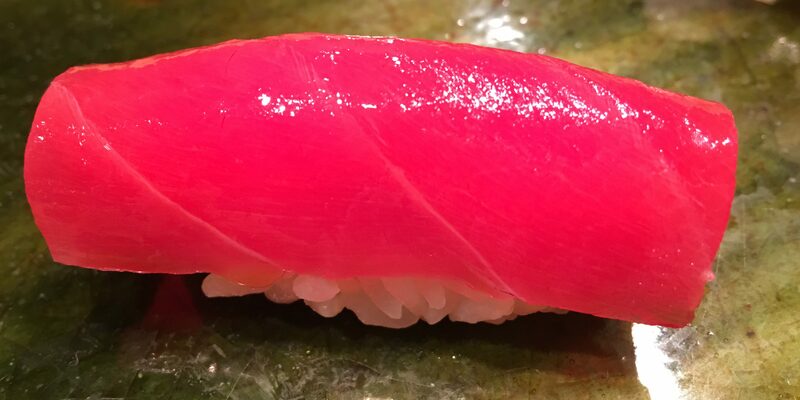 And ending the tuna series with Otoro. 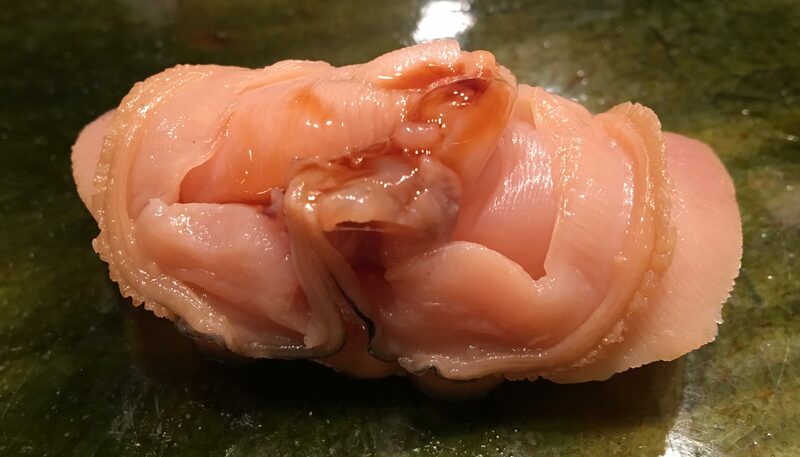 Sanpei-san said this was Bonito. Interesting. Ika was next. 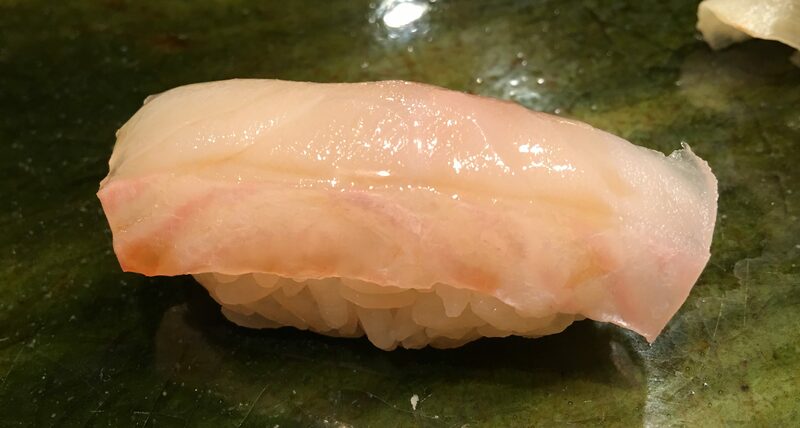 Kohada. Laughing it up and telling stories as we dined. 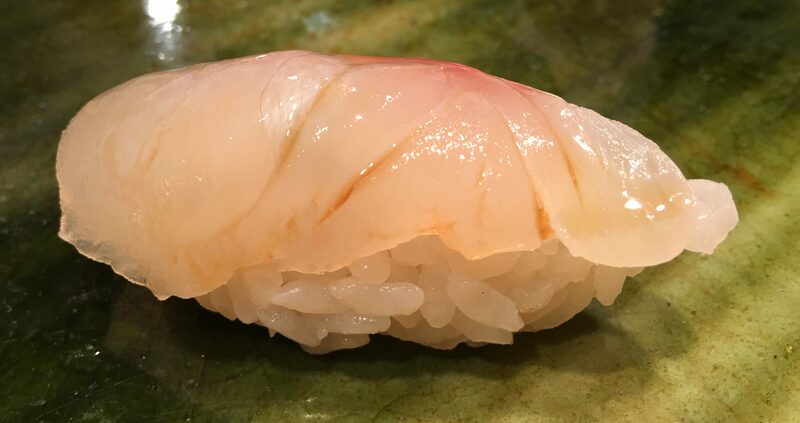 Kurama Ebi. 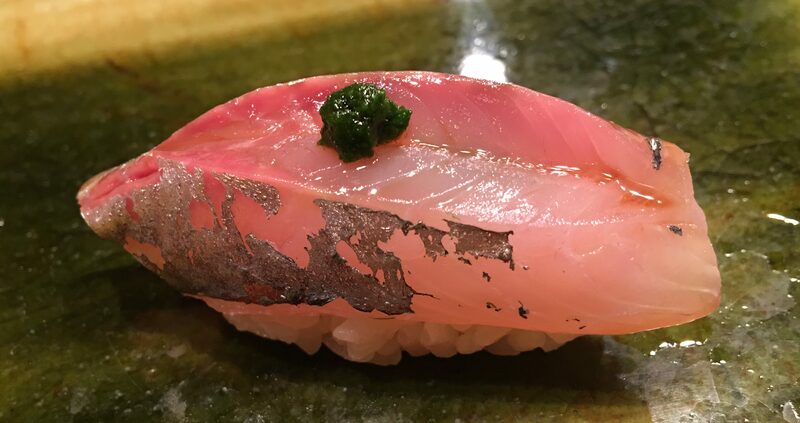 Aji. This one I have never had before. 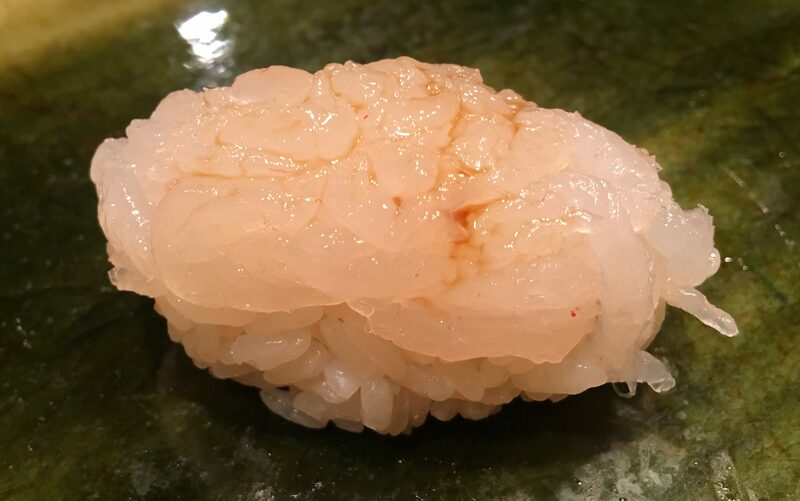 This is baby shrimp. 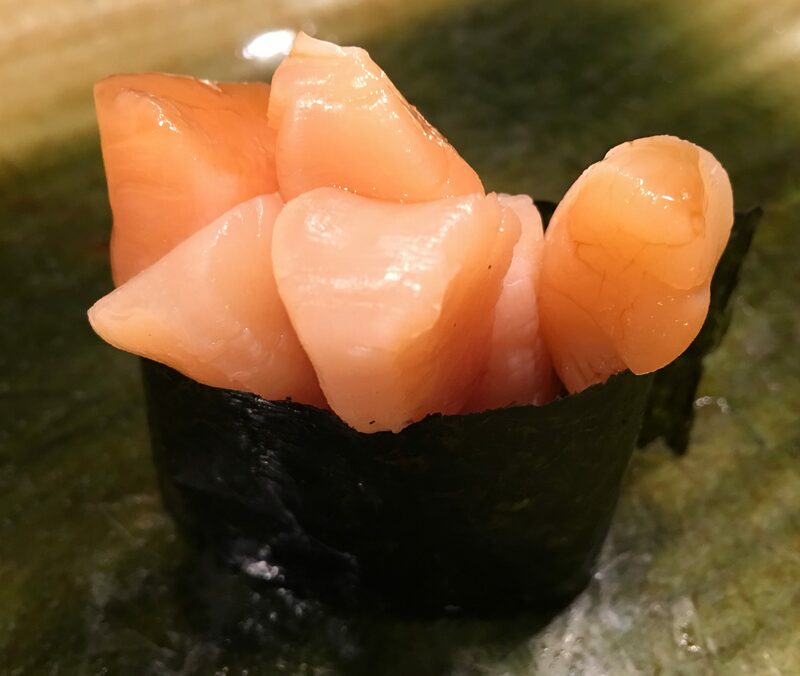 Hamaguri Baby Scallops. 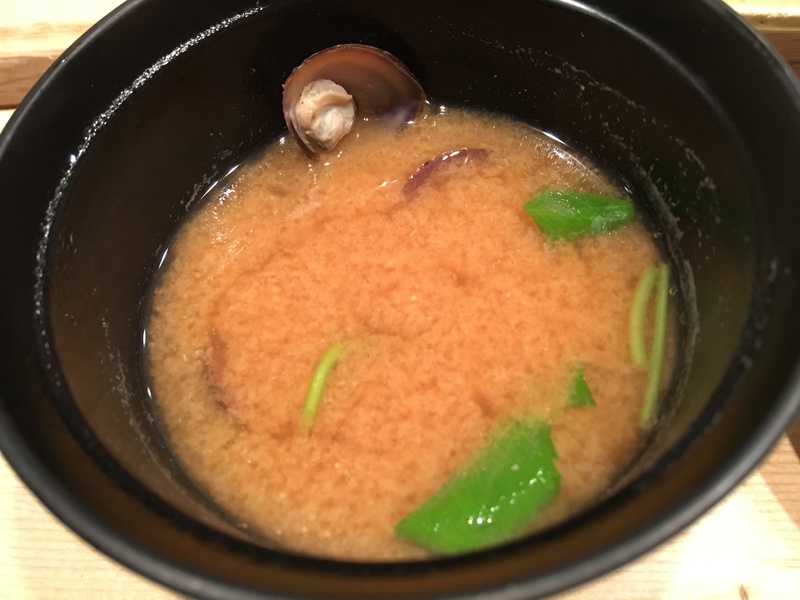 Ikura Miso Soup with Clams Uni! 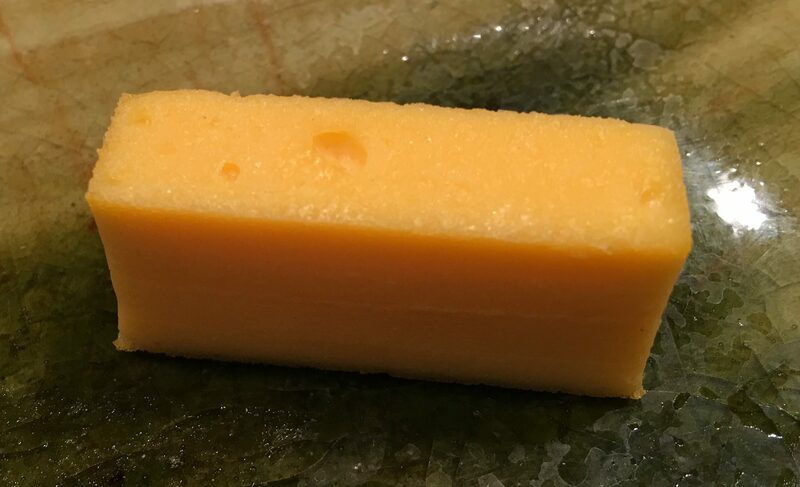 Anago Tamago. This one is almost like custard. 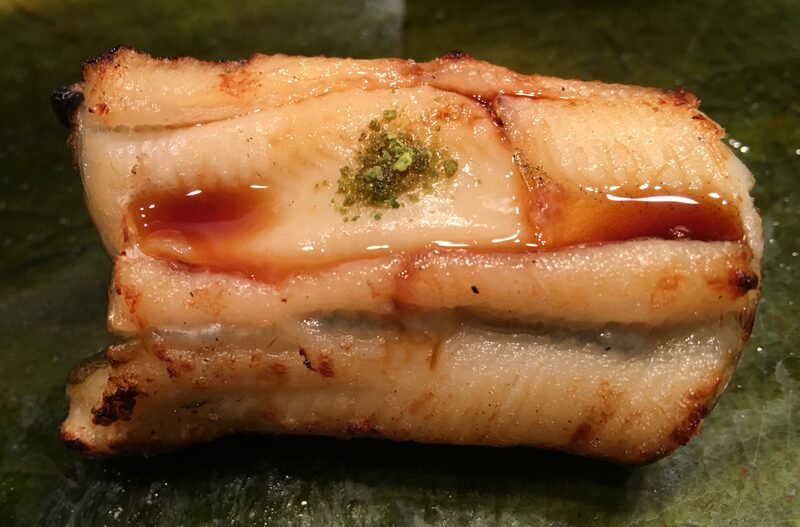 Akagai, or Red Clam, Roll. And that was it. My full course was finished. Amazing tastes and freshness. What a meal! 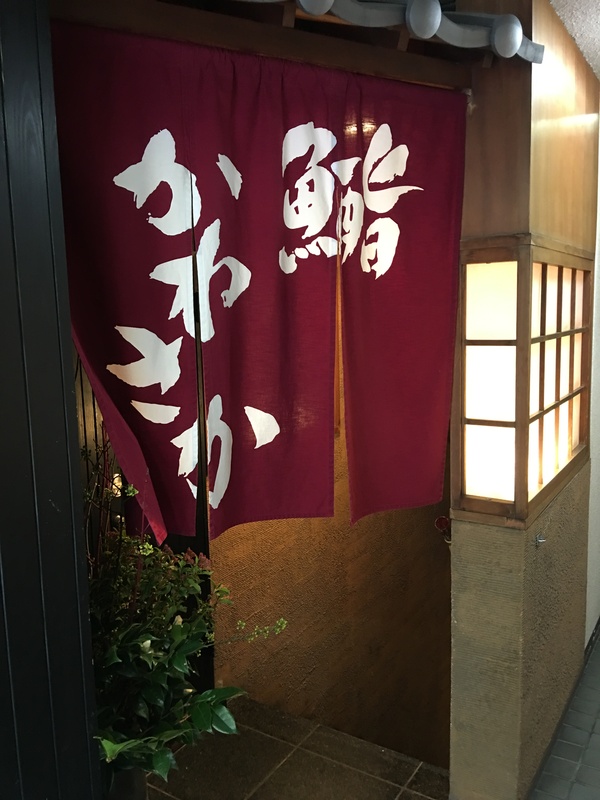 It was not as warming and homey and comforting as Sushi Kuwano, but this is still a great atmosphere and a lot of fun to be in while we ate. We still got to talk to everyone and had a good time also. 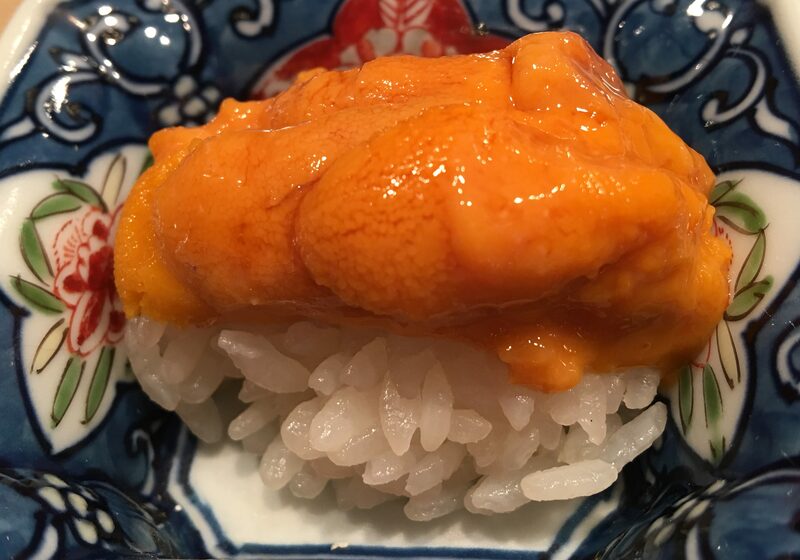 If this is Michelin star sushi, keep signing me up! 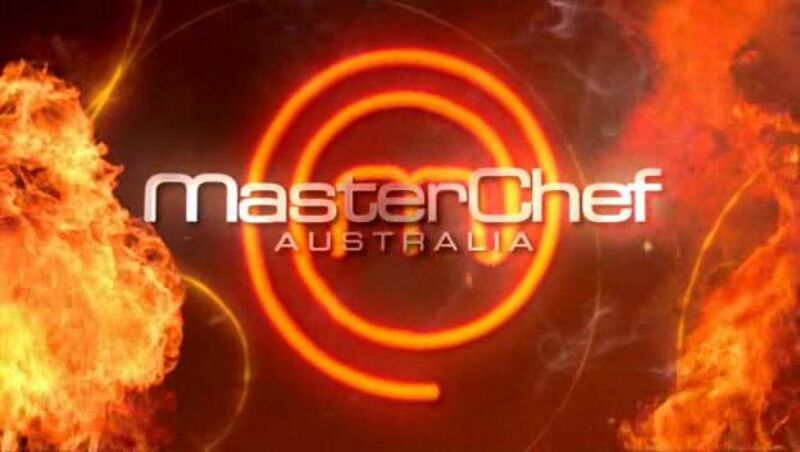 Posted in Celebrity Chefs, Michelin Stars, Sushi, TokyoTagged Celebrity Chef, Michelin Star, Sushi, TokyoBookmark the permalink. Hi, it’s interesting reading your blog. 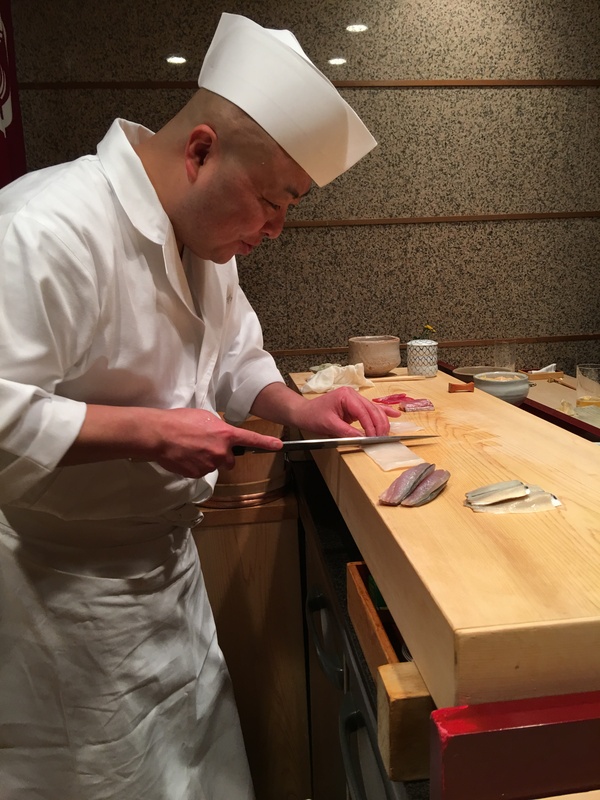 I am also planning to visit a traditional sushi bar when I am in Tokyo in Dec. Sushi Kanesaka seems interesting. Can I know the per pax price for the course you have taken above? Would you mind telling me how you have made the reservation? The lunch course was around $300 USD. It can range anywhere from $200-$500 depending upon which place you choose. Lunch can sometimes be less expensive. The best way to book a place is to contact your concierge at the hotel and have them book it for you. Tell them the place you want to book and a date or range of dates and times that are good for you. 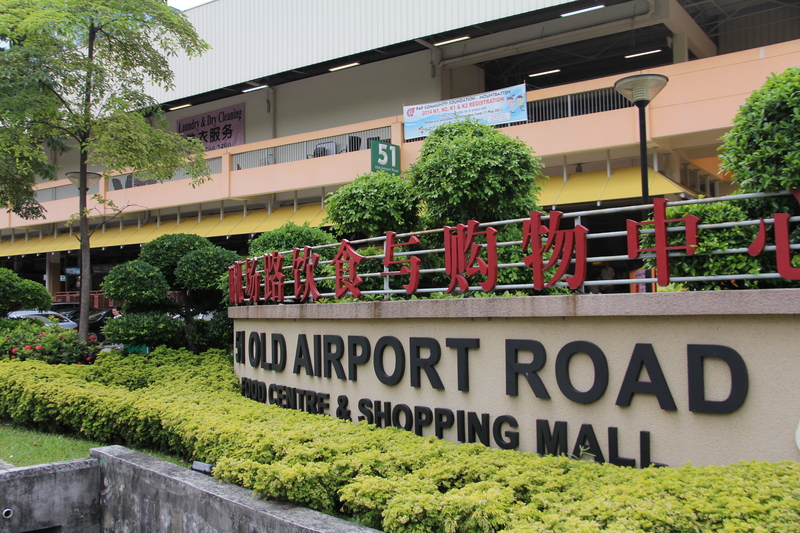 A lot of these places do not take reservations over the phone from foreigners unless it’s from the hotel concierge. Hope this helps and happy eating! Thanks a lot for your prompt and useful reply.